I have to start with a confession. 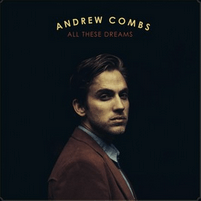 Prior to the announcement of the 2016 Country2Country line-up, I had never heard of Andrew Combs, and I’m sure many other die-hard country fans hadn’t either. I was puzzled as to why C2C had chosen such an unknown artist to accompany country superstars such as Eric Church and Kacey Musgraves on Sunday’s line-up. Nevertheless, I gave Andrew’s new album ‘All These Dreams’ a listen, and it soon became very clear as to why the organisers believe he will be a success at the festival. Perhaps a slightly risky choice, Andrew Combs is a very old-school artist with a sound not too dissimilar to the likes of Roy Orbison and The Mavericks. The album begins with ‘Rainy Day Song’, a wonderful introduction to a truly sublime album. The simplistic melody allows Andrew to show off his unique, raspy voice which requires no studio alterations, and you can tell from his emotional delivery that these songs are very personal and heart-felt. The beauty of the song lies in the slide guitar used throughout, creating a very distinctive traditional country feel. In many ways, ‘Rainy Day Song’ represents Andrew as an artist; no electric guitars, no studio tweaking. Just pure, quality country music. ‘Nothing To Lose’ follows. After seeing the C2C 2016 line-up, this was the first Andrew Combs song I heard, and since then I have been completely hooked. This track is a master class in country music, combining beautifully written lyrics with a stunning melody. This is honestly one of the best pieces of music I have heard for a very very long time. The warmth of a track is something which I instantly engage with, and ‘Nothing To Lose’ has this in abundance. From the first note, you feel wrapped up in the melody and I can’t stress the quality of this enough. By far the stand-out track on the album, this is one you won’t want to miss. My earlier reference to Roy Orbison is summed up with the third track on the album, ‘Foolin’. This has become a regular feature of Andrew’s set lists, and one that I am very much looking forward to hearing at the O2 in March. It’s one of those that you’ll be singing all week after one or two listens. Lyrically, the song is incredibly catchy and one which could really reach its potential when performed live. Other stand-outs include the title track ‘All These Dreams’, a foot-tapping tune which is almost a throwback to the sixties/seventies, as well as ‘Month Of Bad Habits’, a stunning track which once again wraps you up with the intriguing lyrics and rather atmospheric melody. From start to finish, the album is a true masterpiece, and one which deserves a lot more recognition than it currently receives. If you reacted to the Country2Country line-up with disappointment regarding Andrew Combs’ inclusion (as I did at first, I must admit! ), please give ‘All These Dreams’ a chance. With this, Andrew has demonstrated his incredible musical talent, as well as his infectious, unique sound. The more I listen to the album, the more engaged I become, and the more I appreciate the sheer quality of the production. Andrew is certainly one to watch.